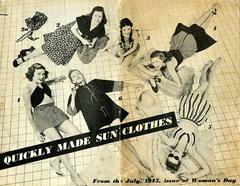 1945 Woman's Day Quickly Made Sun Clothes instructions and layout pattern, size 12-16. Six outfits for summer included: striped skirt and bra top, wrap-around skirt and bra-bolero, bag, little sunner's suit, ballerina skirt, bustle, quickie sun suit, finger tip coat. 8 page pamphlet with layout and instructions.